New recruits of the Afghan 215th Corps assemble at Camp Shorabak in Helmand Province. Afghan Major General Wali Mohammad Ahmadzai addresses new recruits of the Afghan 215th Corps at Camp Shorabak in Helmand Province. 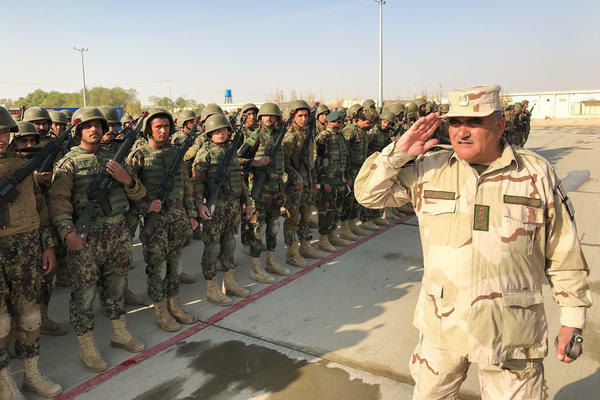 The American military has placed faith in General Ahmadzai's ability to lead the fight against the Taliban in southern Afghanistan. Afghan Major General Wali Mohammad Ahmadzai and his team plan operations against the Taliban with their American Marine counterparts in Helmand. Ahmadzai is short and squat, with a thick black mustache and thinning hair. He's a trained commando, one of the toughest soldiers. His two predecessors were fired for corruption. The most recent one is in jail. Only last year, the Americans here were singing his corrupt predecessor's praises. After a recent dinner with U.S. Marine officers, Ahmadzai spoke with NPR about the challenges ahead. Corruption is just a start, Ahmadzai says through his translator, of what's wrong with Helmand. "Helmand is one of the main concerns and has a lot of problems," the general says. "One of the main problems is poppy cultivation and trade and trafficking." The poppy crop is turned into opium and heroin. It finances the Taliban and fuels the corruption, especially among politicians and police. And the poppy problem goes far beyond insurgents and corruption. Afghan heroin is now found in large amounts in Europe and North America, and the country remains the top opium producer in the world. Helmand is also plagued by Afghanistan's neighbors — Iran and Pakistan — moving weapons or Taliban fighters into the country. Afghan and U.S. officials say Iran is funneling arms to the Taliban, and Pakistan for years has allowed Taliban safe havens. "That's also one of the problems that made Helmand the mother of problems for the country," says the general. "And it's just like a cancer, but we try our best to overcome." The Taliban still control or influence wide swaths of Helmand Province and other parts of Afghanistan. Officials say in the first six months of 2017, the Taliban grabbed even more territory, and now more than 40 percent of the country's districts are either under Taliban control or are contested. Col. Matthew Reid is one of 300 Marines who arrived in Helmand earlier this year. He struggles to explain how bad things looked back then. "It was in need of some effort," he says. "So as we came in, our essential task was do not allow the provincial capital to fall." That capital, the city of Lashkar Gah, did not fall. And now the Marines are helping Ahmadzai push out and retake more land from the Taliban. Reid said the general leads from the front, something his fired predecessors did not do. "He gets it and he has a bias for action," says Reid. "He's got a commando background. What's good about what we're seeing now in operations is his brigade commanders and [battalion] commanders, they're all now following his lead. So now, with his leadership, they're following by example. You're starting to see his subordinates take on a bias for action, and that's good. One guy can't do it all." But it's not just Ahmadzai's aggressive ways that will make a difference. The American military this year started pounding the Taliban with airstrikes — double the number from last year. The Marines say that has given new confidence to Afghan troops. The Marine commander in Helmand, Brig. Gen. Roger Turner, watches a drone feed on a video screen at an Afghan base. Taliban fighters are seen in the grainy footage, dashing along a dirt trail. Soon, bombs fall and they disappear in a cloud. But the increased airstrikes have also led to more civilian casualties. Civilian casualties due to coalition and Afghan airstrikes have risen by 52 percent in the first nine months of 2017, compared to the same period last year, according to a recent report by John Sopko, the special inspector general for Afghanistan reconstruction, citing the U.N. The report, again citing the U.N., says 38 percent of the total number of civilians killed by airstrikes — 177 of 466 people — were attributed to international forces. But the report notes that U.S. Forces-Afghanistan disagrees with the U.N.'s methodology on this measure and has a different number, attributing 43 civilian casualties to international airstrikes in those nine months. The U.N.'s number also appears to run counter to what Gen. John Nicholson, the top commander of U.S. forces in Afghanistan, said in an interview with NPR last month. "We've seen an increase in [civilian casualties] caused by the insurgents and an actual reduction in [civilian casualties] caused by the coalition and Afghans," said Nicholson. "And the [civilian casualties] caused by U.S. airstrikes is less than 2 percent. It's very low." Aggressive U.S. tactics is a movie we've seen before. Turner — as well as Reid — served in Afghanistan years ago, when thousands of Marines were deeply involved in fighting the Taliban. Some of the younger Marines on their first tour here say they wish they were in the fight, rather than just advising. "The Marines would love to be the ones taking the fight directly to the enemy," says Turner. "And so they would love to be doing that. But at the same time, they realize we're here to enable our partners." A day later, Turner is huddled with those partners — Ahmadzai and his subordinates. They spread out a map to plan new operations against the Taliban, north of the provincial capital. Turner offers a pep talk. 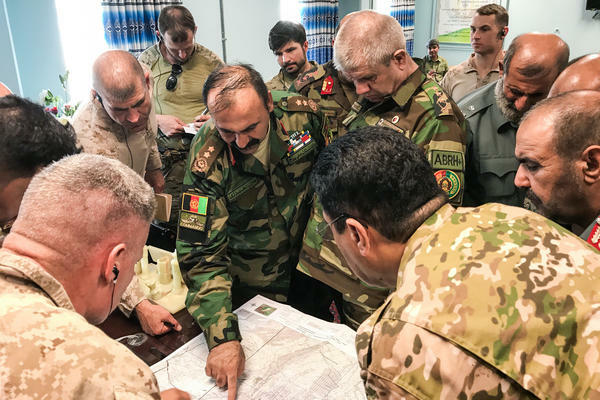 "If we work together," the general tells them, "with all of the Afghan forces working together and then the support we provide you, you can over-match the Taliban every single time." That's still an open question. Afghan army and police casualties continue to rise. One Afghan soldier NPR interviewed said his unit was nearly overrun in northern Helmand Province earlier this year, and it was only the arrival of the Afghan commandos that saved them. Now that soldier, Capt. Muhammad Allem, is training to be a commando himself, taking part in live-fire exercises at Camp Commando outside Kabul. "I just want to be more professional," says Allem. "That's why I joined the commandos and I will serve for the future." The Americans want to double the number of commandos — currently at 17,000 — in the coming years, and also double the size of the Afghan air force. The U.S. is providing that force with American Black Hawk helicopters to replace its aging Russian Mi-17s. Still, sharply increasing these elite forces will be a challenge in a country where around 70 percent of the population is illiterate, and young, educated Afghans continue to flee the country for places like India and Germany. So in the meantime, the fate of Afghanistan will continue to fall on Marines like Staff Sgt. Daniel Edwards, now on his third tour in Helmand Province. On his first tour, back in 2009 at the height of the Marine push, he lost seven friends. Now at age 30, he admits he is older and wiser, and not as eager to fight as the younger Marines. But he says he will come back to train, to make sure Afghanistan doesn't once again become a terrorist haven. His thoughts turn to his son, just 18 months old. "I'll come back to this country as many times as I have to," he says, "to make sure the generations that are as old as my son don't." Hundreds of marines were killed, and thousands more were wounded during seven years of fighting in Afghanistan's Helmand Province. And when they left in 2014, the Taliban quickly gained control of the province. Earlier this year, the Marines returned with just a small training force, and they're placing their hopes on a new Afghan general they hope will lead his troops to success. NPR's Tom Bowman recently traveled to Helmand. TOM BOWMAN, BYLINE: The new troops of the Afghan 215th Corps are assembled on a wide plaza in midday at their base called Shorabak. 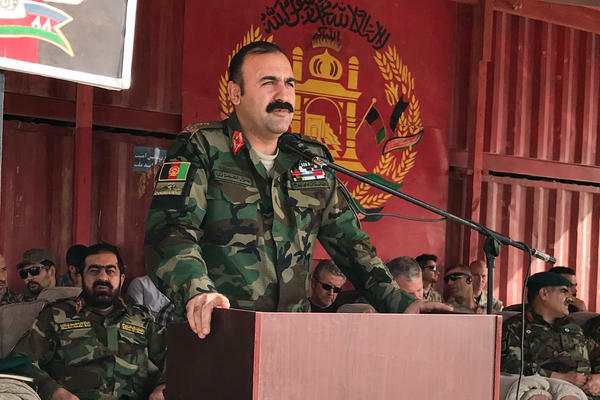 And passing in review is their new commander, Major General Wali Mohammad Ahmadzai. He proved himself fighting the Taliban in northeast Afghanistan. Now he's in charge of Helmand, the most deadly province in a troubled country. General Ahmadzai is short and squat with a thick, black mustache and thinning hair. He's a trained commando, the toughest soldiers. After dinner later that night with Marine officers, General Ahmadzai sits and talks about the challenges ahead. His two predecessors were fired for corruption. The most recent one's in jail. Only last year, the Americans here were singing his praises. GENERAL WALI MOHAMMED AHMADZAI: (Foreign language spoken). BOWMAN: "Corruption's just a start," this general says through his translator, "of what's wrong with Helmand." AHMADZAI: (Through interpreter) Helmand is one of the main concerns and has a lot of problems. One of the main problems is poppy. BOWMAN: Poppy that's turned into opium and heroin. It finances the Taliban and fuels the corruption, especially among politicians and police. AHMADZAI: (Through interpreter) But it's not only that. We have problems with our neighbors around here, too. BOWMAN: The neighbors Iran and Pakistan, moving weapons or Taliban fighters into Afghanistan. Colonel Matthew Reid is 1 of just 300 marines who arrived earlier this year. He struggles to explain how bad things looked back then. COLONEL MATTHEW REID: It was in need of some effort. (Laughter) It was I think - you know, as we came in, our essential task was do not allow the provincial capital to fall. BOWMAN: The city of Lashkargah did not fall, and now the marines are helping General Ahmadzai push out and grab more land from the Taliban. Colonel Reid said the general leads from the front, something his fired predecessors did not do. REID: He gets it. You know, and he has a bias for action. He's got a commando background. What's good about what we're seeing now in operations are his brigade commanders - they're all now following his lead. So I think through his leadership by example, you're starting to see his subordinate leaders take on that bias for action. And that's extremely encouraging. I mean, one guy can't do it all. BOWMAN: But it's not just General Ahmadzai's aggressive ways. The American military this year started pounding the Taliban with airstrikes, double the number from last year. The marines say that has given a new confidence to Afghan troops. UNIDENTIFIED MAN: (Unintelligible) Just did a strike on those individuals. BOWMAN: The Marine commander here, Brigadier General Roger Turner, watches a drone feed on a video screen at an Afghan base. BRIGADIER GENERAL ROGER TURNER: Still not good for a mitigated 500-pounder in there. It's too close. BOWMAN: That's a 500-pound bomb. Taliban fighters are seen in the grainy footage dashing along a dirt trail. Soon bombs do fall, and they disappear in a cloud. This is a movie we've seen before. Turner, as well as Colonel Reid, were here years ago when thousands of marines were deeply involved in fighting the Taliban. TURNER: The Marines would love to be the ones taking the fight directly to the enemy. And so they would love to be doing that. But at the same time, I mean, they realize that what we're doing here is we're here to enable our partners. BOWMAN: A day later, Turner is huddled with those partners, General Ahmadzai and his subordinates. They spread out a map to plan new operations against the Taliban north of the provincial capital. Turner offers a pep talk. TURNER: If we work together, with all of the Afghan forces working together and then the support that we provide you, you can overmatch the Taliban every single time. BOWMAN: ...Taking part in a live fire exercise. The Americans want to double the number of commandos, currently at 17,000, in the coming years. CAPTAIN MOHAMMED ALIM: (Through interpreter) I just want to be more professionalism. That's why I joined commando, and I will serve for the future. BOWMAN: Serve for the future - and so will U.S. troops now entering their 17th year here. Staff Sergeant Daniel Edwards is one of those troops. He's on his third tour. And on his first back in 2009, at the height of the marine push here, he lost seven friends. STAFF SERGEANT DANIEL EDWARDS: You fight for your country as a 19- or 20-year-old kid because you don't want your kids to go. And I tell my wife that all the time. I say, I'll come back to this country every day if I have to make sure the generations that are as old as my son don't. BOWMAN: Tom Bowman, NPR News. Transcript provided by NPR, Copyright NPR.